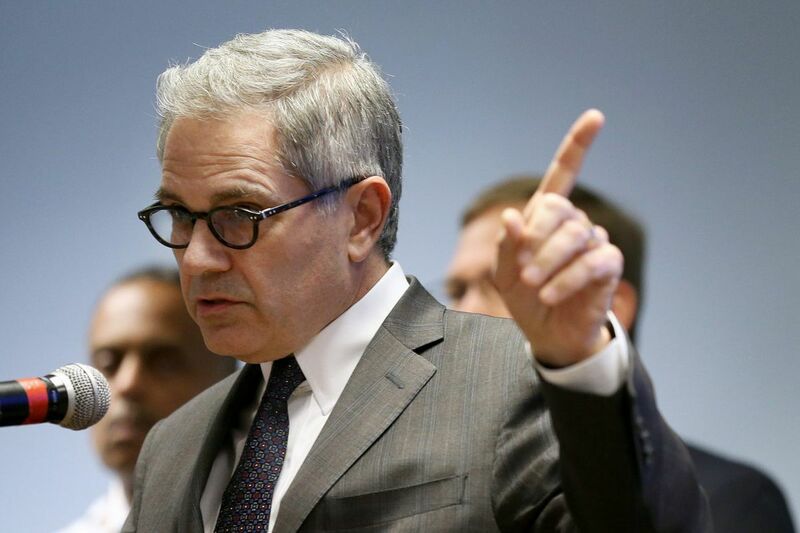 District Attorney Larry Krasner is not releasing a list of 26 suspect police officers compiled under his predecessor, Seth Williams. The Philadelphia District Attorney's Office last year secretly compiled a list of Philadelphia police officers with a history of lying, racial bias, or brutality, in a move to block them from testifying in court. The confidential list of about two dozen was assembled by prosecutors on a special Police Misconduct Review Committee at the order of former District Attorney Seth Williams, sources familiar with the roster said. . It was supposed to attack locally a national problem: police "testilying" — falsifying evidence, framing suspects, and lying about it in court. The list has not been made public, but the sources said it included Reginald V. Graham, who in 2007 arrested the rapper Meek Mill, whose jailing for violating probation on those gun and drug charges has stirred widespread debate about the fairness of the criminal-justice system. It was not clear why Graham, 47, was put on the list. He retired from the force last year after making more than 400 arrests during his 22-year career. He declined to comment. The list was intended only for internal use, as a guide to determine when a potentially tainted officer's testimony should be used. Under the office's policy, front-line prosecutors were instructed to get top-level permission before calling such an officer. Prosecutors, according to sources, did not want to release the list out of concern for the officers' privacy rights and the broad impact it might have on past convictions involving the officers. Appellate lawyers for Mill were never told of the list or that Graham was on it, prosecutors acknowledged. The existence of the list also was kept from attorneys for hundreds of past defendants arrested by the officers the District Attorney's Office had identified as tainted. The list has not come into play since its creation because none of the flagged officers has recently brought an arrest into the system, sources said. District Attorney Larry Krasner last week confirmed the existence of the list in response to questions from the Inquirer and Daily News. He declined to name the officers on it, saying he was still reviewing the work of the police misconduct committee. Two sources who have seen the list said it includes a detective handling homicide cases. The district attorney said he would have a comprehensive plan for addressing problem officers and their testimony in three months. Krasner called the implementation "apparently ineffectual at best." According to District Attorney's Office sources, he believes the list represents an extremely limited snapshot of the problem of police misconduct on the 6,300-officer force. Kelley Hodge, who was Krasner's predecessor, said she was unaware of the specifics of the list, and declined to respond to Krasner's criticism. Williams, who is currently serving a federal prison for corruption, left office in June 2017. Krasner was elected later that year. The existence of the list could have significant implications for many defendants, prosecutors and taxpayers. After federal prosecutors and the FBI several years ago alleged that a group of Philadelphia narcotics offices had been framing suspects and stealing money and drugs, the District Attorney's Office agreed to drop 800 cases and free scores of convicted defendants. The City of Philadelphia has paid out at least $2 million so far to settle civil suits. The officers were eventually acquitted of the corruption charges, but the episode prompted Williams to declare he would not use their testimony in future trials. He also appointed top deputies to the six-member misconduct panel to consider how to handle testimony from officers who had been shown to be corrupt or untrustworthy. At that time, his staff argued that the office needed to develop a full policy about allegedly rogue officers rather than making decisions "willy nilly," as one source said. In creating a list of tainted officers, the misconduct committee limited the selection to officers disciplined since August 2016. The committee focused primarily on officers found guilty by the Police Board of Inquiry of selected serious offenses such as lying, violence, and abuse of power. The first names were put on the roster in January 2017. Because of its limited review period, the list does not include the six officers caught up in the earlier FBI investigation of the narcotics unit. A tiny subset on the list was of police awaiting trial on criminal offenses, such as an off-duty drunken driving arrest, sources said. For this cohort, the policy called for notifying defense attorneys of such arrests but put few restrictions on the officers' testimony. In cases involving officers with a pattern of misconduct, front-line prosecutors were to obtain permission from the top officials of the District Attorneys Office before using their testimony, sources said. The creation of such a list is not without precedent. Prosecutors in the Seattle area, among other regions, have for a decade kept a list of rogue officers. A spokesman for Fraternal Order of Police Lodge 5 said the union was unaware of the list. "But if there is a list, we want to see the list, and we would like every opportunity to vet the list," said spokesman Mike Neilon. In interviews last week, defense lawyers roundly criticized prosecutors for keeping the policy secret and the list hidden. "The list has never been acknowledged to exist, though it has been requested repeatedly by me and other attorneys," said Bradley S. Bridge, a top attorney for the Public Defender's Office in Philadelphia. Bridge and other defense lawyers said it was essential for their clients to know if police had a pattern of lying or worse. Among his clients, Bridge represents a 27-year-old woman arrested on drug charges by Graham, the officer who arrested Mill in 2007 and was since put on the list. Bridge said he expects to file a court petition to determine if his client deserves a new trial and should be freed from prison. Graham was the only officer who testified against the woman at trial. Sources familiar with the police misconduct committee said it had been working on a process to review past cases involving the officers on the list and determine how to notify convicted defendants that tainted officers were involved in their cases. Although police disciplinary records are secret and it's unclear why Graham landed on the roster last year, one of his former partners testified about him in a series of sworn depositions in October 2016. "I would steal with Reggie Graham," said former narcotics officer Jeffrey Walker, who was convicted of police corruption and spent two years in prison. "There was stealing in that whole squad, but these are the people I was basically breaking bread with." In his deposition, Walker was answering questions from Krasner, who was sworn in as district attorney in January but at the time was the lead attorney in litigation against the city over the alleged abuses. Walker was the lead witness in 2015 when federal prosecutors brought their much-publicized case against the six police officers. Walker himself pleaded guilty to corruption charges. A jury, in acquitting his six former colleagues, rejected testimony he offered as part of the government's case. Still, his sworn accounts of crimes he and others committed while working on the narcotics squad factored into the city's decision last year to settle dozens of lawsuits, paying between $15,000 and $625,000 to former defendants. Graham, who has repeatedly called Walker a liar, was not charged with any crimes. He took early retirement in March last year. Four months later, his name was put on the misconduct panel's list. In 2007, a decade before Graham would land on the list, he was a narcotics officer about halfway through his career when he arrested Mill, then 19 and whose birth name is Robert Rihmeek Williams. Mill, whose music has sold tens of thousands of CDs and downloads, is currently in a state prison in Chester. Mill's lawyer, Joseph Tacopina of New York City, declined comment for this story. Court records show Mill's conviction was based almost entirely on the word of Graham. He was the only one of several officers involved in the arrest to testify at the 2008 trial before Common Pleas Court Judge Genece E. Brinkley. At his trial, Mill's testimony contradicted Graham's on key points. Graham told the judge that he had watched Mill sell what was later determined to be crack cocaine in Southwest Philadelphia. He said a confidential informant later made another purchase from Mill. Graham's assertion was used to obtain a search warrant for a nearby home that Mill was seen entering and leaving after each alleged transaction. But when officers showed up to search the house, Mill, said Graham, pulled a gun from his waistband and ducked behind a nearby car. "Myself and Officer Johnson took cover behind the green van and observed Mr. Williams pull the gun out of his waistband," Graham testified. He "was behind the car looking like he was trying to give off a shot." Mill dropped the gun and tried to flee, Graham said, allowing officers to eventually wrestle Mill to the ground. They said they found 21 packets of marijuana, $45, and a loaded 9mm handgun nearby with its serial number shaved off. Mill admitted he had a gun but denied selling drugs or pointing the weapon at police. "When he screamed 'Police,' I turned my back to put the gun on the ground in the car and came back up and laid down on the back of the car," he testified. In the end, Brinkley acquitted two others arrested with Mill but convicted the rapper of drug possession, firearms violations. and simple assault – the last charge tied to Graham's testimony that Mill had brandished a gun at officers. He would serve five months in jail. Ten years later, Mill was back before Brinkley for violating his probation. By then Graham was retired and Mill was a hip-hop star. The judge jailed Mill for two to four years for the parole violation. Staff writers Chris Palmer and Dylan Purcell contributed to this article.